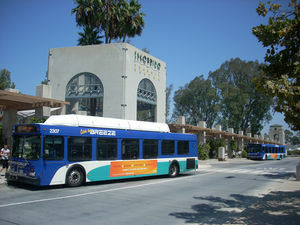 NCTD provides local and regional transit in Northern San Diego County. It serves cities of Carlsbad, Del Mar, Encinitas, Escondido, Oceanside, San Marcos, Solana Beach, and Vista. It operates buses (Breeze), Sprinter light rail between Oceanside and Escondido, and Coaster commuter rail between Oceanside and San Diego. NCTD connects with Amtrak Pacific Surfliner, OCTA, Riverside Transit Agency, and MTS.